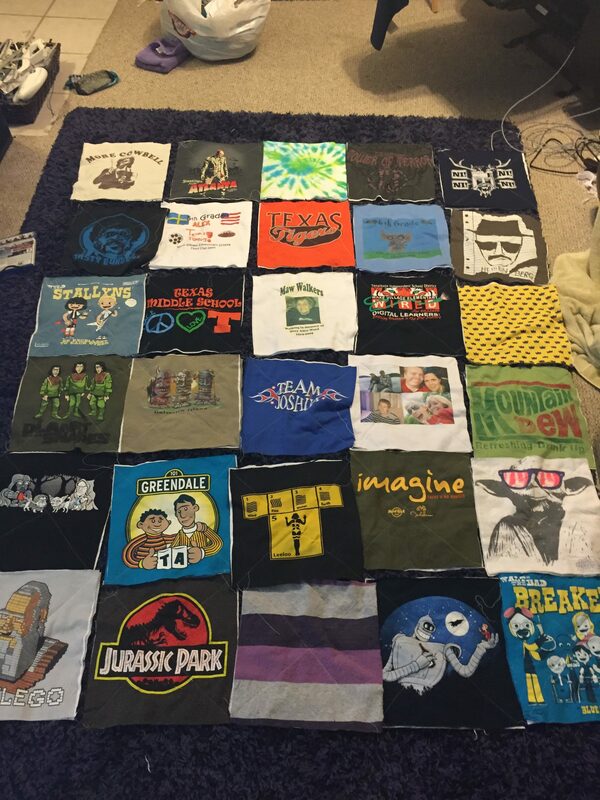 I’ve been saving the kid’s T-Shirt’s for years with the intention of making a tshirt quilt. I read tons of tutorials, gathered all of my supplies and a few months ago finally decided to dive in! 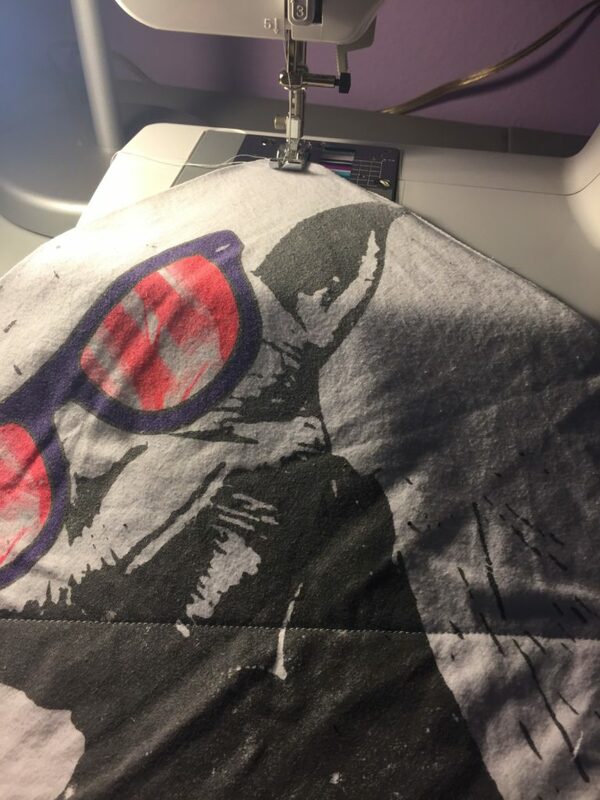 I started by placing my template over each t-shirt to see which ones would be too big (the design would get cut off) and which were too small (would include the seams) and eliminated both. 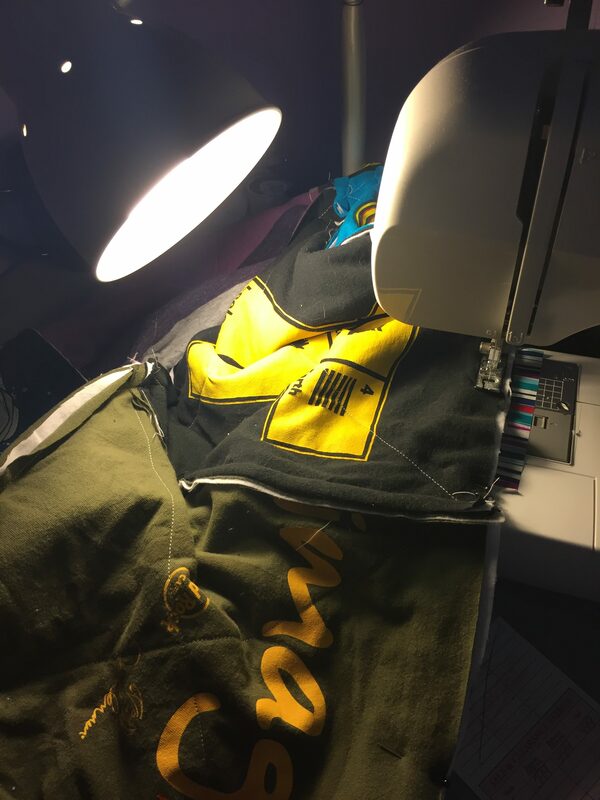 Once I found which designs fit perfectly for the size I wanted, I began cutting them out with a rotary cutter, using the whole tshirt so that the back of the tshirt could be the back of my quilt. I also cut out white flannel pieces with the same template and sandwiched them in between each front and back. Once I had all of my shirts cut and “sandwiches” made, I sewed an X on each one to stabilize the fabric. 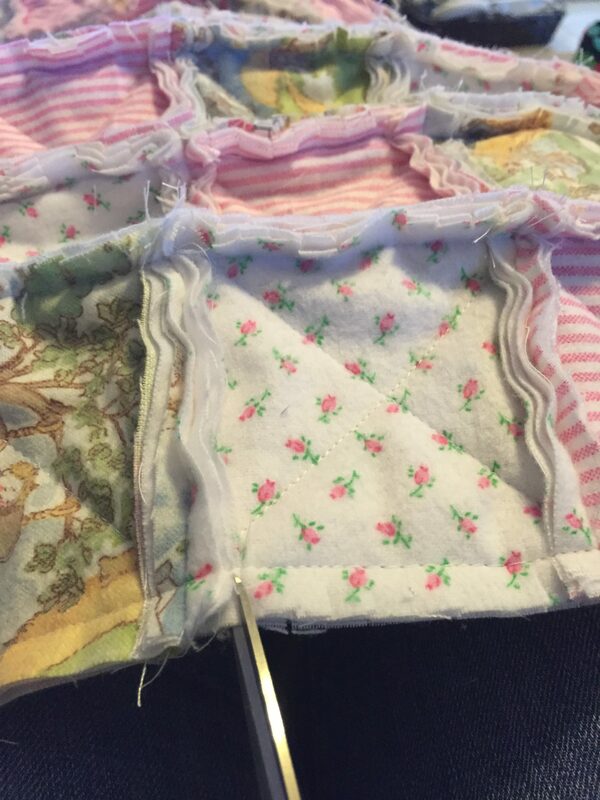 Once all of my Xs were sewn, I set out all of my squares to decide how I wanted them placed. Then I began sewing them into rows. Since this is a rag quilt I sewed “wrong” sides together, so that the seam stuck up on the right side. 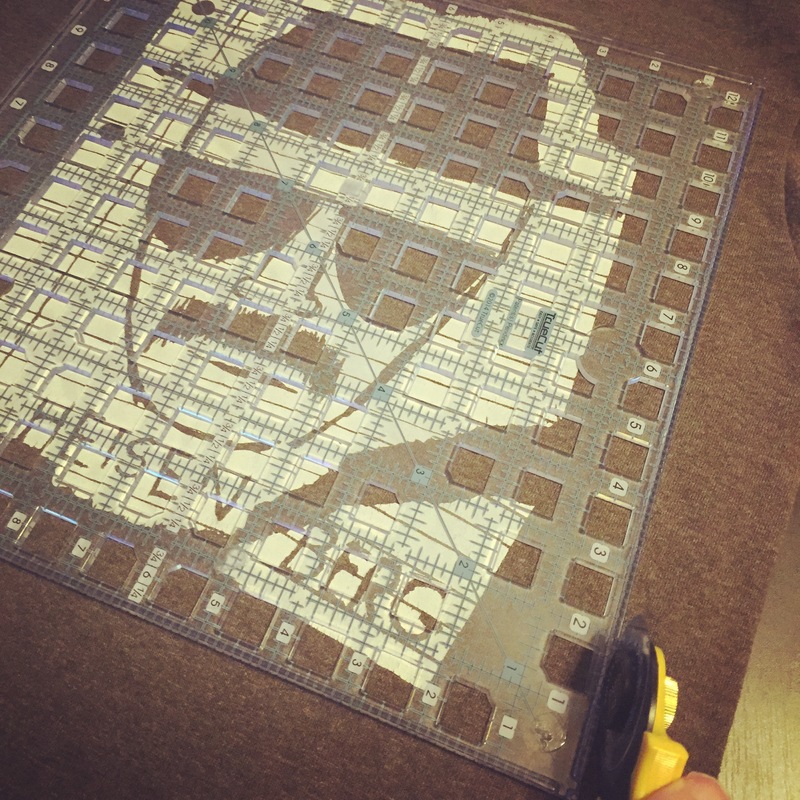 That’s the part that will be clipped later to achieve the “rag” look. My seams aren’t prefectly straight here but this kind of quilt is very forgiving, so it’s ok! And this is how it looks when all the rows are sewn together. One last sewing part is shown in the next photo, sewing a seam all around the edges of the whole quilt. 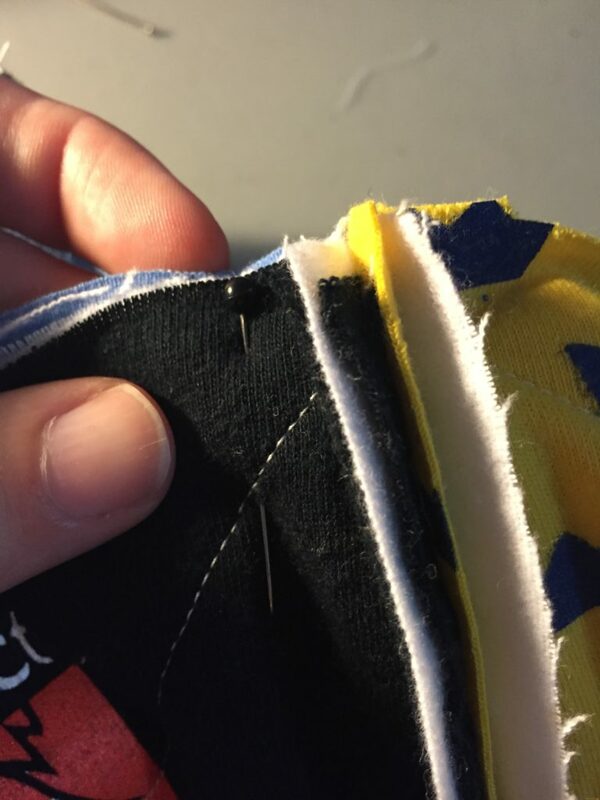 After all of the sewing is done, you clip the seams each half inch or so. 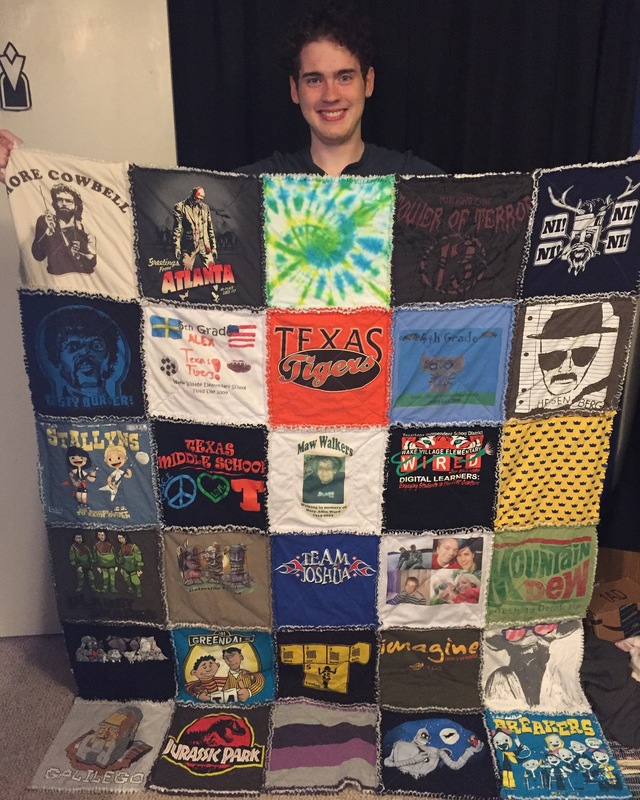 I didn’t get a photo of that, but below is a photo from a flannel rag quilt I did a few months ago. I’ll post that full tutorial soon! #1 tip on this part is get sharp, quality scissors. Also, be careful you don’t cut all the way to the thread. I had to go back and sew up parts I accidentally cut on this one. Once that step is done, just throw in the washer and then the dryer. This helps fray the edges. 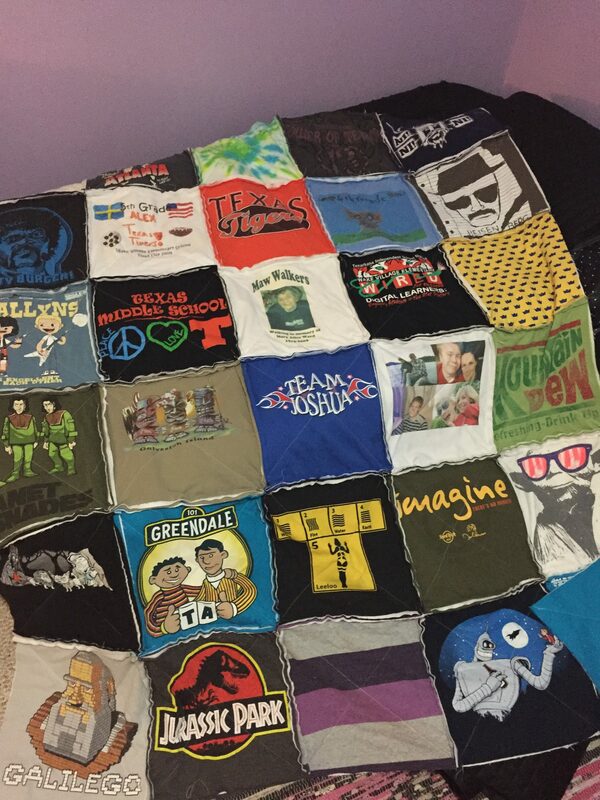 T-Shirt Quilts will just kind of ruffle and won’t fray and create the puffy edges cotton or flannel rag quilts make. This is the finished product. The kid is very happy with it. It contains years of memories and keeps him warm at night! Now I want to make myself one! One final bit of advice. A walking foot makes this project a bit easier so that the fabric doesn’t pull and stretch while you are sewing. Sissy 1 on How I got my happy on in the northeast! Copyright © 2019 Leslie Gail.